I have an orange pi pc2 device with armbian-release on it. 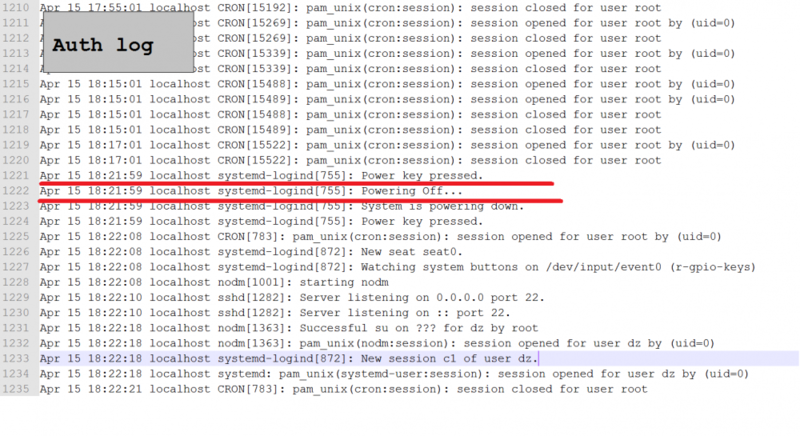 My orange pi pc2 was shut down, in auth log file I see "Power key pressed. Powering Off... System is powering down." But there is no power key and no one can press powering off by console or interface. How it can be, why orange go to powering off by him self? Apr 15 18:21:59 localhost systemd-logind: Power key pressed. Apr 15 18:21:59 localhost systemd-logind: System is powering down. Apr 15 18:22:08 localhost systemd-logind: New seat seat0. Apr 15 18:22:10 localhost sshd: Server listening on 0.0.0.0 port 22. Apr 15 18:22:10 localhost sshd: Server listening on :: port 22. Apr 15 18:22:18 localhost systemd-logind: New session c1 of user dz. Apr 15 18:22:25 localhost sshd: Received SIGHUP; restarting. Apr 15 18:22:26 localhost sshd: Server listening on 0.0.0.0 port 22. Apr 15 18:22:26 localhost sshd: Server listening on :: port 22. Apr 15 18:22:26 localhost sshd: Received SIGHUP; restarting. Apr 15 18:22:08 localhost kernel: [    0.000000] psci: probing for conduit method from DT. Apr 15 18:22:08 localhost kernel: [    0.000000] psci: PSCIv1.1 detected in firmware. Apr 15 18:22:08 localhost kernel: [    0.000000] psci: MIGRATE_INFO_TYPE not supported. Apr 15 18:22:08 localhost kernel: [    0.000000] rcu: Hierarchical RCU implementation. Apr 15 18:22:08 localhost kernel: [    0.000000] rcu: 	RCU restricting CPUs from NR_CPUS=8 to nr_cpu_ids=4. Apr 15 18:22:08 localhost kernel: [    0.000000] arch_timer: cp15 timer(s) running at 24.00MHz (phys). Apr 15 18:22:08 localhost kernel: [    0.002820] rcu: Hierarchical SRCU implementation. Apr 15 18:22:08 localhost kernel: [    0.006790] SMP: Total of 4 processors activated. Apr 15 18:22:08 localhost kernel: [    0.179938] hw-breakpoint: found 6 breakpoint and 4 watchpoint registers. Apr 15 18:22:08 localhost kernel: [    1.293827] RPC: Registered named UNIX socket transport module. Apr 15 18:22:08 localhost kernel: [    1.293831] RPC: Registered udp transport module. Apr 15 18:22:08 localhost kernel: [    1.293833] RPC: Registered tcp transport module. Apr 15 18:22:08 localhost kernel: [    1.293836] RPC: Registered tcp NFSv4.1 backchannel transport module. Apr 15 18:22:08 localhost kernel: [    1.673148] Installing knfsd (copyright (C) 1996 okir@monad.swb.de). Apr 15 18:22:08 localhost kernel: [    1.758151] [drm] Supports vblank timestamp caching Rev 2 (21.10.2013). Apr 15 18:22:08 localhost kernel: [    1.758154] [drm] No driver support for vblank timestamp query. Apr 15 18:22:08 localhost kernel: [    1.938555] mmc0: Problem switching card into high-speed mode! Apr 15 18:22:09 localhost NetworkManager: <info>  [1555341729.0568] manager[0x2bac5200]: monitoring kernel firmware directory '/lib/firmware'. Apr 15 18:22:09 localhost NetworkManager: <info>  [1555341729.0570] monitoring ifupdown state file '/run/network/ifstate'. Apr 15 18:22:09 localhost NetworkManager: <info>  [1555341729.5546] init! Apr 15 18:22:09 localhost NetworkManager: <info>  [1555341729.5564] device added (path: /sys/devices/platform/soc/1c30000.ethernet/net/eth0, iface: eth0): no ifupdown configuration found. Apr 15 18:22:09 localhost NetworkManager: <info>  [1555341729.5564] device added (path: /sys/devices/virtual/net/lo, iface: lo): no ifupdown configuration found. Apr 15 18:22:09 localhost NetworkManager: <info>  [1555341729.5565] end _init. Apr 15 18:22:09 localhost NetworkManager: <info>  [1555341729.5568] settings: loaded plugin keyfile: (c) 2007 - 2015 Red Hat, Inc.  To report bugs please use the NetworkManager mailing list. Apr 15 18:22:09 localhost NetworkManager: <info>  [1555341729.5914] SettingsPlugin-Ofono: init! Apr 15 18:22:09 localhost NetworkManager: <info>  [1555341729.5917] SettingsPlugin-Ofono: end _init. Apr 15 18:22:09 localhost NetworkManager: <info>  [1555341729.5918] (732827552) ... get_connections. Apr 15 18:22:09 localhost NetworkManager: <info>  [1555341729.6218] SettingsPlugin-Ofono: (732827776) ... get_connections. Apr 15 18:22:09 localhost NetworkManager: <info>  [1555341729.7104] settings: hostname changed from (none) to "dz-device"
Apr 15 18:22:10 localhost NetworkManager: <info>  [1555341730.3118] device (eth0): driver '(null)' does not support carrier detection. Apr 15 18:22:10 localhost NetworkManager: <info>  [1555341730.3155] device (eth0): driver 'dwmac-sun8i' does not support carrier detection. Apr 15 18:22:24 localhost NetworkManager: <info>  [1555341744.3728] device (eth0): Activation: successful, device activated. Apr 15 18:07:44 localhost systemd: Started Daily apt download activities. Apr 15 18:22:00 localhost systemd: Stopping Session c1 of user dz. Apr 15 18:22:00 localhost systemd: Stopped target Timers. Apr 15 18:22:01 localhost rsyslogd: [origin software="rsyslogd" swVersion="8.16.0" x-pid="833" x-info="http://www.rsyslog.com"] exiting on signal 15. Apr 15 18:22:08 localhost systemd: Started Flush Journal to Persistent Storage. Apr 15 18:22:08 localhost systemd-tmpfiles: [/usr/lib/tmpfiles.d/var.conf:14] Duplicate line for path "/var/log", ignoring. Apr 15 18:22:08 localhost systemd: Started Create Volatile Files and Directories. Apr 15 18:22:08 localhost systemd: Reached target System Time Synchronized. Apr 15 18:22:08 localhost systemd: Started udev Kernel Device Manager. Apr 15 18:22:08 localhost systemd: Started Update UTMP about System Boot/Shutdown. Apr 15 18:22:08 localhost systemd: Started Set console font and keymap. Apr 15 18:22:08 localhost systemd: Created slice system-getty.slice. Apr 15 18:22:08 localhost systemd: Found device /dev/ttyS0. Apr 15 18:22:08 localhost systemd: Reached target Sound Card. Apr 15 18:22:08 localhost systemd: Started Raise network interfaces. Apr 15 18:22:08 localhost systemd: Started Armbian ZRAM config. Apr 15 18:22:08 localhost systemd-udevd: Process '/usr/sbin/alsactl -E HOME=/run/alsa restore 0' failed with exit code 99. Apr 15 18:22:08 localhost systemd: Started Armbian memory supported logging. Apr 15 18:22:08 localhost systemd: Started Restore / save the current clock. Apr 15 18:22:08 localhost systemd: Reached target System Initialization. Apr 15 18:22:08 localhost systemd: Started Daily Cleanup of Temporary Directories. Apr 15 18:22:08 localhost systemd: Listening on Avahi mDNS/DNS-SD Stack Activation Socket. Apr 15 18:22:08 localhost systemd: Started Daily apt download activities. Apr 15 18:22:08 localhost systemd: Started Daily apt upgrade and clean activities. Apr 15 18:22:08 localhost systemd: Reached target Timers. Apr 15 18:22:08 localhost systemd: Listening on CUPS Scheduler. Apr 15 18:22:08 localhost systemd: Started CUPS Scheduler. Apr 15 18:22:08 localhost systemd: Reached target Paths. Apr 15 18:22:08 localhost systemd: Listening on D-Bus System Message Bus Socket. Apr 15 18:22:08 localhost systemd: Reached target Sockets. Apr 15 18:22:08 localhost systemd: Started Armbian hardware monitoring. Apr 15 18:22:08 localhost systemd: Started Armbian hardware optimization. Apr 15 18:22:08 localhost systemd: Reached target Basic System. Apr 15 18:22:08 localhost systemd: Started Regular background program processing daemon. Apr 15 18:22:08 localhost systemd: Started D-Bus System Message Bus. Apr 15 18:22:08 localhost avahi-daemon: Found user 'avahi' (UID 109) and group 'avahi' (GID 116). Apr 15 18:22:08 localhost avahi-daemon: Successfully dropped root privileges. Apr 15 18:22:08 localhost avahi-daemon: avahi-daemon 0.6.32-rc starting up. Apr 15 18:22:08 localhost avahi-daemon: WARNING: No NSS support for mDNS detected, consider installing nss-mdns! Apr 15 18:22:08 localhost avahi-daemon: Successfully called chroot(). Apr 15 18:22:08 localhost avahi-daemon: Successfully dropped remaining capabilities. Apr 15 18:22:08 localhost systemd: Started Avahi mDNS/DNS-SD Stack. Apr 15 18:22:08 localhost systemd: Started Permit User Sessions. Apr 15 18:22:08 localhost systemd: Started Save/Restore Sound Card State. Apr 15 18:22:08 localhost avahi-daemon: No service file found in /etc/avahi/services. Apr 15 18:22:08 localhost systemd: Started LSB: Speech Dispatcher. Apr 15 18:22:08 localhost loadcpufreq:    ...done. Apr 15 18:22:08 localhost systemd: Started LSB: Load kernel modules needed to enable cpufreq scaling. Apr 15 18:22:08 localhost avahi-daemon: Network interface enumeration completed. Apr 15 18:22:08 localhost avahi-daemon: Server startup complete. Host name is dz-device.local. Local service cookie is 2854329968. Apr 15 18:22:08 localhost systemd: Started LSB: Start/stop sysstat's sadc. Apr 15 18:22:08 localhost systemd: Started LSB: No Display Manager. Apr 15 18:22:08 localhost systemd: Started Set console scheme. Apr 15 18:22:08 localhost systemd: Started Login Service. Apr 15 18:22:08 localhost cpufrequtils:    ...done. Apr 15 18:22:08 localhost systemd: Started LSB: set CPUFreq kernel parameters. Apr 15 18:22:08 localhost sysfsutils:    ...done. Apr 15 18:22:08 localhost systemd: Started LSB: Set sysfs variables from /etc/sysfs.conf. Apr 15 18:22:08 localhost systemd: Started System Logging Service. Apr 15 18:22:09 localhost systemd: Started Network Manager. Apr 15 18:22:09 localhost systemd: Reached target Network. Apr 15 18:22:09 localhost systemd: Started Unattended Upgrades Shutdown. Apr 15 18:22:09 localhost systemd: Started OpenVPN service. Apr 15 18:22:09 localhost systemd: Started Authenticate and Authorize Users to Run Privileged Tasks. Apr 15 18:22:09 localhost systemd: Started Accounts Service. Apr 15 18:22:09 localhost systemd: Started Network Manager Script Dispatcher Service. Apr 15 18:22:09 localhost systemd: Started Hostname Service. Apr 15 18:22:10 localhost systemd: Started OpenBSD Secure Shell server. Apr 15 18:22:10 localhost avahi-daemon: Joining mDNS multicast group on interface eth0.IPv6 with address fe80::e53f:a06f:eb37:40d7. Apr 15 18:22:10 localhost avahi-daemon: New relevant interface eth0.IPv6 for mDNS. Apr 15 18:22:10 localhost avahi-daemon: Registering new address record for fe80::e53f:a06f:eb37:40d7 on eth0.*. Apr 15 18:22:10 localhost systemd: Started Network Manager Wait Online. Apr 15 18:22:10 localhost systemd: Reached target Network is Online. Apr 15 18:22:10 localhost systemd: Started LSB: Advanced IEEE 802.11 management daemon. Apr 15 18:22:10 localhost systemd: Started /etc/rc.local Compatibility. Apr 15 18:22:10 localhost systemd: Started Getty on tty1. Apr 15 18:22:10 localhost systemd: Started Serial Getty on ttyS0. Apr 15 18:22:10 localhost systemd: Reached target Login Prompts. Apr 15 18:22:11 localhost ntp:    ...done. Apr 15 18:22:11 localhost systemd: Started LSB: Start NTP daemon. Apr 15 18:22:11 localhost systemd: Reached target Multi-User System. Apr 15 18:22:11 localhost systemd: Reached target Graphical Interface. Apr 15 18:22:11 localhost systemd: Started Update UTMP about System Runlevel Changes. Apr 15 18:22:11 localhost systemd: Startup finished in 8.802s (kernel) + 26.669s (userspace) = 35.472s. Apr 15 18:22:18 localhost systemd: Created slice User Slice of dz. Apr 15 18:22:18 localhost systemd: Started Session c1 of user dz. Apr 15 18:22:18 localhost systemd: Reached target Timers. Apr 15 18:22:18 localhost systemd: Reached target Paths. Apr 15 18:22:18 localhost systemd: Reached target Sockets. Apr 15 18:22:18 localhost systemd: Reached target Basic System. Apr 15 18:22:18 localhost systemd: Reached target Default. Apr 15 18:22:18 localhost systemd: Startup finished in 47ms. Apr 15 18:22:18 localhost systemd: Started User Manager for UID 1000. Apr 15 18:22:21 localhost systemd: Mounted FUSE Control File System. Apr 15 18:22:23 localhost avahi-daemon: Joining mDNS multicast group on interface eth0.IPv4 with address 192.168.120.107. Apr 15 18:22:23 localhost avahi-daemon: New relevant interface eth0.IPv4 for mDNS. Apr 15 18:22:23 localhost avahi-daemon: Registering new address record for 192.168.120.107 on eth0.IPv4. Apr 15 18:22:24 localhost dhclient: bound to 192.168.120.107 -- renewal in 42728 seconds. Apr 15 18:22:24 localhost systemd: Started Network Manager Script Dispatcher Service. Apr 15 18:22:25 localhost systemd: Reloading OpenBSD Secure Shell server. Apr 15 18:22:25 localhost systemd: Reloaded OpenBSD Secure Shell server. Apr 15 18:22:26 localhost systemd: Reloading OpenBSD Secure Shell server. Apr 15 18:22:26 localhost systemd: Reloaded OpenBSD Secure Shell server. Apr 15 18:22:26 localhost pulseaudio: [pulseaudio] module.c: Failed to open module "module-x11-publish". Apr 15 18:22:27 localhost systemd: Started Disk Manager. Apr 15 18:22:50 localhost pulseaudio: [alsa-sink-CDC PCM Codec-0] alsa-sink.c: ALSA woke us up to write new data to the device, but there was actually nothing to write. Apr 15 18:22:50 localhost pulseaudio: [alsa-sink-CDC PCM Codec-0] alsa-sink.c: Most likely this is a bug in the ALSA driver 'sun4i_codec'. Please report this issue to the ALSA developers. Apr 15 18:22:50 localhost pulseaudio: [alsa-sink-CDC PCM Codec-0] alsa-sink.c: We were woken up with POLLOUT set -- however a subsequent snd_pcm_avail() returned 0 or another value < min_avail. Apr 15 18:22:50 localhost pulseaudio: [pulseaudio] bluez5-util.c: GetManagedObjects() failed: org.freedesktop.DBus.Error.NoReply: Did not receive a reply. Possible causes include: the remote application did not send a reply, the message bus security policy blocked the reply, the reply timeout expired, or the network connection was broken. Apr 16 15:33:31 localhost systemd: Started Daily apt download activities. Apr 16 15:33:31 localhost systemd: Started Daily apt upgrade and clean activities. Problem has been fixed with this commit. Use self-made kernel or wait for an update.